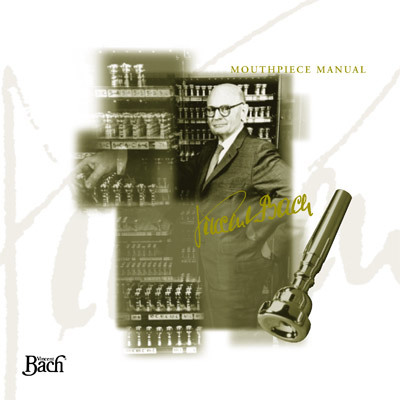 Click a Bach mouthpiece style Category to browse. Vincent Bach was a rare combination of artist and engineer. A mechanical genius and acclaimed trumpet soloist, his instruments and mouthpieces are used today in every major studio and orchestra in the world. Bach personally designed the tools and composed the plans that continue to set the high standards for making all Bach products today. Bach trumpet mouthpieces have been designed in an orderly progression from the largest to the smallest diameters, and from the deepest to the most shallow cup, all with a choice of rim designs. Rim shape is described for each individual model. Model numbers progress numerically from model no. 1 with the largest cup diameter, to model no. 20C with the smallest cup diameter. Cup depths are notated with letters. "A" cups are the deepest; standard cups have no letter designation; progressively shallower cups are marked "B" through "F". Mouthpiece Express offers all standard model/spec Bach Trumpet, Cornet, Flugelhorn and Trombone mouthpieces in the heavy Megatone configuration as a Special Order (in addition to Bach's short list of Megatone models commonly available). Browse Megatone Mouthpieces for all the many Megatone models. Or, choose a basic model Megatone, perhaps spruce-it-up with a special Throat or Backbore for a quicker turn around!